Dario Minieri. Or, as many people call him, "the guy with the scarf". Dario Minieri was born in 1985 in Rome, Italy. Minieri has been a professional poker player for all of his adult life, having first tasted success back in 2005. Like many other young online poker professionals (such as David Williams), Minieri was introduced to the world of gaming through Magic: The Gathering. By the ripe age of 16, Minieri found himself travelling the world to take part in as many Magic tournaments as possible. Minieri was then introduced to online poker through one of his friends, and the rest, as they say, is history. Minieri immediately found success playing in SNGs, but his first really big score would come in a $10 rebuy tournament that he ended up taking down for $12,000. After winning $12,000 in just one evening, Minieri decided to devote his full attention to the world of online poker. Minieri would enjoy a great deal of success on Pokerstars, but he really put himself on the map in the fall/early winter of 2007. Minieri started his heater by winning over $400k over the course of just 2200 Sit and Go's. Minieri was often playing 5 or 6 $5600 Heads Up Sit and Go's at once against some of the best poker players in the world, but he was still able to win most of his matches. Minieri followed this up by winning over $155k in one day on Pokerstars in MTTs (Multi-Table Tournaments), including a deep run in the Sunday Million. Dario Minieri parlayed his online fame into a lucrative spot on "Team Pokerstars Pro", which is a position that he still enjoys today. Minieri also has the distinction of being the first person to ever use Frequent Player Points to buy a Porsche through the Pokerstars Store. Dario Minieri has over $1.85 million in total lifetime "live" tournament cashes. His first cash came in November of 2005, while his biggest cash came at the 2008 World Series of Poker, when he took down the $2,500 No Limit Hold'em event for his first (and only) bracelet and over $528,000. Minieri also made a deep run in the 2007 World Series of Poker main event, where he ended up finishing in 96th place for $67,535. Minieri was one of the first players to ever achieve "Supernova Elite" status on Pokerstars. Minieri, who recently got married, enjoys soccer and watching movies. 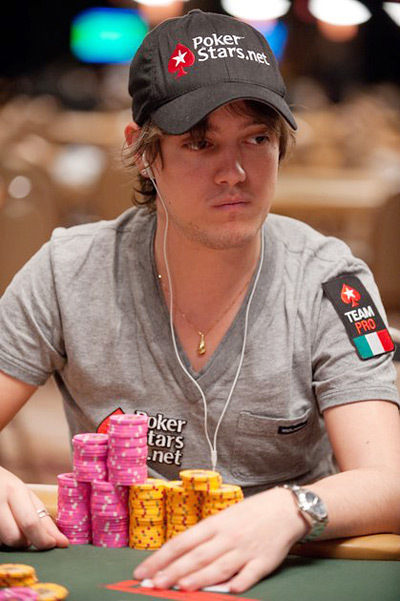 Dario Minieri plays on Pokerstars as "Dariominieri".